DILLINGTON HOUSE, Somerset’s flagship residential business conference centre, has been awarded a unique five star rating by VisitBritain, the official website of the British Tourist Authority. The former home of George III’s Prime Minister, Lord North, Dillington came top of a list of 36 college and universities in the campus section; the only one awarded a five-star billing. The website is viewed by tens of thousands of potential visitors every year. VisitBritain, impressed by the quality their independent assessors found at Dillington, said people were looking for somewhere different to visit and had woken up to the ancient charms of Somerset. It was now providing competition for its Cotswolds’ neighbours. Dillington House, while providing first class conference facilities for up to 160 delegates, is also the county’s prestigious seat of adult residential learning. It is an ideal base to explore the region’s great attractions. And, said VisitBritain, at a surprisingly reasonable cost. The Mendips, Wells, Glastonbury, West Somerset, Bath and Bristol, Dorset’s Jurassic coastline, Plymouth and access to Devon and Cornwall, Stonehenge and Avebury, and the region’s famous gardens are all within easy reach of Dillington House. Manager Wayne Bennett is delighted with the award. 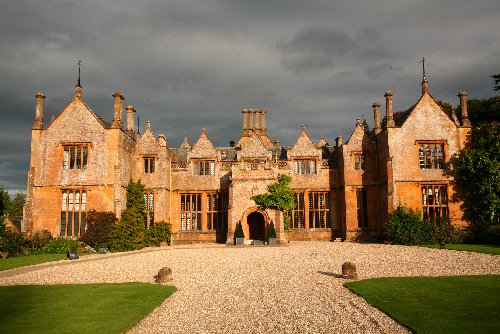 “Dillington House is an amazing venue for business. A wide range of rooms and settings together with all the technology and customer support make any meeting away from the office a complete breeze.,” he says. “It is a creative place where colleagues can work together and get things done without the usual distractions. That is an offer which comes with a free lunch...no small matter. Dillington’s home-cooked cuisine, much from the estate’s walled garden run by former Fleet St editor and organic grower Rosie Boycott ,is a mouth-watering favourite with all who venture inside this classic architectural country house. But alongside the old something amazingly contemporary is emerging. At the end of the year the historic buildings will be complimented by a new building adding two large studio rooms and fifteen bedrooms complete with stylish wet room facilities. Dillington House is blending the old with the new in ways that bridge the divide between the best of the past and the world in which we live today. This press release was distributed by ResponseSource Press Release Wire on behalf of Prone in the following categories: Entertainment & Arts, Leisure & Hobbies, Food & Drink, Business & Finance, Education & Human Resources, Media & Marketing, Public Sector, Third Sector & Legal, for more information visit https://pressreleasewire.responsesource.com/about.